F FÂ = Feelings of fear: Stranger danger, fear my child will be injured, fear my child won’t succeed or keep up with over-scheduled peers and fear of nature itself in the form of mosquitoes, poison ivy, tics, etc. C C = Create/Enhance/Preserve any and all natural spaces: transform yards and playgrounds into natural playscapes, create natural play areas at parks, identify nearby nature for schools and daycare centers, and preserve nature camps. 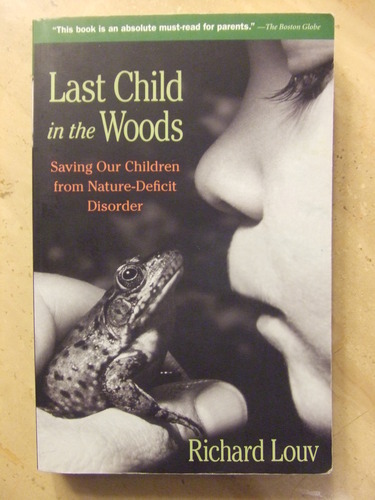 E EÂ = Ever-shrinking natural spaces: Unsafe neighborhoods, overbuilt suburbs, closures of parks and nature camps, manicuring of common areas H H = Help our children access natural places. Be a good example, limit electronics, allow them to walk to a park or walk with them. A AÂ = Addiction to electronics A A = Allow children to run, play, climb and take risks: Remember the risk of no risk. Being indoors and sedentary is not “safer” when you consider longterm health effects. R R = Running ragged: No free time, overly structured lives, over-scheduled kids N N = NATURE! R R = Regulations that defy common sense: “No running!” and “If kids play naturally, we’ll be sued!” G G =Â Growing the Leave No Child Inside Network: Reaching more people,Â becoming a LNCI Ambassador, helping reach the tipping point toÂ cultural change; transforming from an indoor to an outdoor culture. E E = Education. Educate yourself and raise awareness in every way you can. Keep facts on hand to respond to doubters.